Highlights: Long before any recorded human history in Yellowstone, a massive volcanic eruption spewed an immense volume of ash that covered all of the western U.S., much of the Midwest, northern Mexico and some areas of the eastern Pacific. The eruption dwarfed that of Mt. St. Helens in 1980 and left a caldera 30 miles wide by 45 miles long. That climactic event occurred about 640,000 years ago, and was one of many processes that shaped Yellowstone National Park--a region once rumored to be "the place where hell bubbles up." Geothermal wonders, such as Old Faithful, are evidence of one of the world's largest active volcanoes. These spectacular features bemused and befuddled the park's earliest visitors, and helped lead to the creation of the world's first national park. In 1872, President Ulysses S. Grant signed a law declaring that Yellowstone would forever be "dedicated and set apart as a public park or pleasuring ground for the benefit and enjoyment of the people." It also became America's first National Park. In the morning head for Salt Lake City, the capital of Utah and the Mormon capital of the world. On the way, you will be in awe by the vastness of the salt flats and enchanted by the beauty of the Great Salt Lake, the largest salt water lake in the Western Hemisphere. In the afternoon travel along the Wasatch Mountains and pass through land of scorched rocks. These lava fields of barren expanse have been underlain by rhyolite and overlain by basalt over thousands of years. Then visit Idaho Falls on the Snake River, which has one of the largest water hydro projects in Idaho. Taking a stroll by the river and you will be overwhelmed by the sound and force of the rushing, cascading water. Overnight in West Yellowstone. Visit Yellowstone National Park, the first and oldest National Park in the world. 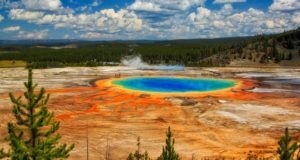 Highlights include: Grand Canyon of Yellowstone, Fountain Paint Pot Geyser Basin, Midway Geyser Basin, and the most famous one of all, the “Old Faithful”. There are various wildlife that calls the park its home, such as the bison, moose, and the grizzly bear. Continue on to Grand Teton National Park, the tallest peak rises to 13,770 feet and twelve of the peaks in Teton reach above 12,000 feet and support a dozen mountain glaciers. Then tour the town of Jackson, beautiful arches made of elk antlers decorate the central plaza in this town with plenty of shops and restaurants around the area. Overnight stay in Pocatello. Arrive in Utah’s state capital – Salt Lake City. Visit the famous Temple Square and learn about the Mormon settlement in depth. Later in the Afternoon, head to Bryce Canyon National Park. The limited archeological findings indicate that this area was used primarily for hunting with most habitation in the river valleys below. Over time, erosion has carved colorful limestone into thousands of spires, fins, arches and mazes. The formations collectively called “hoodoos,” and are arranged and tinted with various colors. Visit Zion National Park. The name Zion is a Hebrew word meaning a place of refuge. Experience the dramatic landscape of sculptured canyons and soaring cliffs. Overnight stay in Las Vegas. Accommodations will be at the Luxor Hotel and Casino, named for the mythical sword of King Arthur. Immerse yourself in the castle themed resort right in the middle of the Las Vegas Strip. Choose from one of the many eateries on the property, including the Roundtable Buffet, or head down the Strip and stop by one of the other world famous hotels. Note: If you choose to get on bus from Sacramento, we will not drop off at Sacramento when return, please choose another location from our list.